AYER, Mass.--(BUSINESS WIRE)--Cambrooke Therapeutics Inc., a leader in therapeutic nutrition for inborn errors of metabolism and ketogenic diet therapy, announces its latest breakthrough in Phenylketonuria (PKU) medical foods with the purest glycomacropeptide (GMP) based protein: Glytactin BUILD 20/20 and Glytactin RTD Lite 15. These new PKU formulas feature Cambrooke’s next generation Glytactin with just 10 mg of phenylalanine (Phe) in every 10 grams of protein equivalent (PE). This is an average of 40% less Phe per gram of PE than all other GMP-based PKU medical foods. This next generation Glytactin protein source has the purest (lowest Phe) GMP plus naturally fermented amino acids produced by The Ajinomoto Group. Glytactin BUILD 20/20 is the lowest Phe, lowest calorie, nutritionally complete Medical Food and has no sugars or artificial sweeteners. 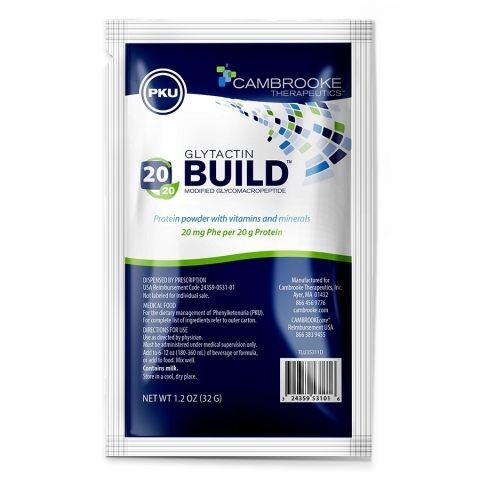 BUILD 20/20 has 20 grams of PE per single serve packet and is perfect for people living with PKU who have increased protein needs. Results from a randomized, controlled, cross-over trial of Glytactin published in 2016 and 2017, led by researchers at the University of Wisconsin, Madison, suggest several key benefits when people with PKU consume Glytactin vs. amino acid medical foods. Some of these benefits include: feeling less hungry between meals and retaining more calcium and magnesium, key minerals that support bone health. Glytactin RTD Lite 15 features Cambrooke’s next generation lowest Phe Glytactin in two delicious, nutritionally complete, ready-to-drink flavors—Coffee Mocha and Mild Vanilla. Each 8-oz. carton of RTD Lite 15 contains 15 grams PE with only 15 mg Phe and just 120 calories. RTD Lite 15 is an ideal way to get on-the-go convenience, great taste and the purest GMP-based medical food available. Cambrooke’s Glytactin with GMP is made from a natural milk whey protein that, in its pure form, contains no Phe. The process of separating GMP from other milk whey proteins results in some residual Phe remaining in the GMP. The introduction of Cambrooke’s GMP with 40% lower Phe follows Cambrooke’s acquisition by Ajinomoto, an expert in natural fermentation and filtration as well as production of pharmaceutical quality amino acids. Cambrooke Therapeutics was the first company to provide individuals with PKU natural whole protein medical foods — beginning in 2010 with Glytactin BETTERMILK. Cambrooke, now a proud member of The Ajinomoto Group, continues to provide people with PKU with a range of medical formula options including ready-to-drink Glytactin RTD and Glytactin RESTORE, Glytactin COMPLETE bars, Glytactin SWIRL dessert mix, and Glytactin BUILD 10 powder. We are excited to leverage Ajinomoto’s strengths as we continue our mission at Cambrooke. About Cambrooke Therapeutics—Founded in 2000, Cambrooke Therapeutics, a proud member of The Ajinomoto Group, is a Massachusetts-based therapeutic nutrition company and global provider of medical nutrition products for patients with serious unmet medical needs. Cambrooke Therapeutics works with physicians and researchers from around the world to develop, test, and commercialize products that are focused on inborn errors of metabolism and intractable epilepsy. More information is available at Cambrooke.com.